A Belgian man who chained himself to a block of marble to show the "burden of history" from which artists cannot escape, was unable to free himself and had to be cut loose after 19 days. 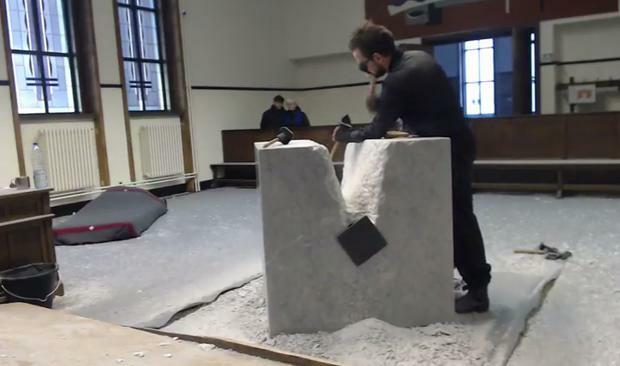 In a performance that lasted 438 hours, Mikes Poppe attached himself to a three-metre (3.28 yard) chain buried in the middle of a block of marble in the courthouse of the Belgian coastal city of Ostend. Poppe, who ate, slept, washed and drew while chained, worked to liberate himself by chiselling the away the stone towards the chain, but eventually had to be cut free. "This block was symbolic of history, the history of art, which I am trying to free myself from. I discovered that this is not possible. It is burden which I must always carry," he said. Entitled 'De Profundis', Poppe's performace was part of a larger exhibition and was live-streamed online. Belgium's best known artist of the genre, Danny Devos, or DDV, has held over 170 performances around the world, including some depicting crime and murder.